QuickSetDNS is a simple tool that allows you to easily change the DNS servers that are used for your Internet connection. You can set the desired DNS servers from the user interface, by choosing from a list of DNS servers that you defined, or from command-line, without displaying any user interface. QuickSetDNS.exe /SetDNS "8.8.8.8,8.8.4.4" "Local Area Connection"
Added 'Open Adapter In RegEdit' option, which allows you to open the settings of the selected network adapter in the Registry. Fixed bug: On some systems, QuickSetDNS failed to display network adapters in the top combo-box. 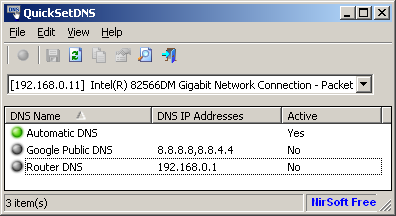 Added 'Router DNS' item, which allows you to choose the internal DNS server of your router. You can easily add more DNS servers to the list by using the 'New DNS Server' option (Ctrl+N). If the 'Automatic DNS' option is selected, then the DNS server information is received from your router automatically, using DHCP. If you have multiple network adapters, you may need to choose the correct network adapter from the combo-box located just below the toolbar of QuickSetDNS. [DNS Servers List] specifies the DNS servers, delimited by comma if there are multiple servers. If empty string is specified ( "" ), QuickSetDNS will set the automatic DNS mode. if 'reg' string is specified , QuickSetDNS will not set the DNS, but it'll update the system with the DNS changes you made in the Registry (Under HKEY_LOCAL_MACHINE\SYSTEM\CurrentControlSet\Services\Tcpip\\arameters\\nterfaces\[Adapter] ). [Network Adapter String] specifies the unique ID string of your network adapter or connection name (e.g: 'Wireless Network Connection 2'). If you don't know what is your Network Adapter String, simply press Ctrl+L (Copy SetDNS Command-Line) and the entire command needed to set the selected DNS server will be copied to the clipboard. If empty string is specified ( "" ), QuickSetDNS will try to choose the correct network adapter automatically. A file named QuickSetDNS_lng.ini will be created in the folder of QuickSetDNS utility. After you finish the translation, Run QuickSetDNS, and all translated strings will be loaded from the language file. If you want to run QuickSetDNS without the translation, simply rename the language file, or move it to another folder. QuickSetDNS is also available in other languages. In order to change the language of QuickSetDNS, download the appropriate language zip file, extract the 'quicksetdns_lng.ini', and put it in the same folder that you Installed QuickSetDNS utility.